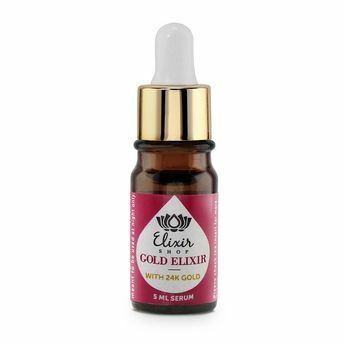 Specially formulated for its advanced beauty benefits, the Gold Elixir works as an effective lightweight moisturizer that gives an even skin tone and slows the aging process. Infused with pure 24k gold, it absorbs into the skin giving it a natural youthful radiance that is noticeable instantaneously. The serum is enriched with the best skincare oils like Lavender and Rosehip and rich in vitamin A, C, and E that have anti-aging properties along with essential fatty acids that keeps your skin moisturized and healthy. Each essential oil has been chosen for its ability to delicately repair and illuminate the skin. Alternatively, you can also find many more products from the Elixir Shop Gold Elixir With 24k Gold range.